Two years ago, the only man running in Haiti’s fraudulent presidential election run-offs on January 24, 2016, Jovenel Moïse, dispossessed as many as 800 peasants and destroyed houses and crops. 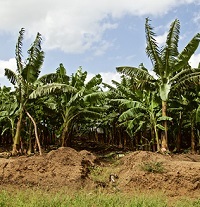 The land grabbed by the company Moïse founded now hosts a private banana plantation. This report is based on extensive interviews, on-site and via phone, with more than 20 government officials, economic development professionals, peasant farmers, and community organizers, between July 2015 and January 2016. We reached out to Agritrans for comment, but they did not respond. The only man running in Haiti’s fraudulent presidential election run-offs on January 24, 2016, Jovenel Moïse, dispossessed as many as 800 peasants – who were legally farming – and destroyed houses and crops two years ago, say leaders of farmers’ associations in the Trou-du-Nord area. 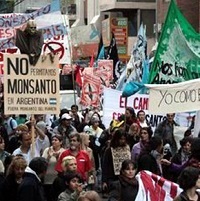 Farmers remain homeless and out of work. 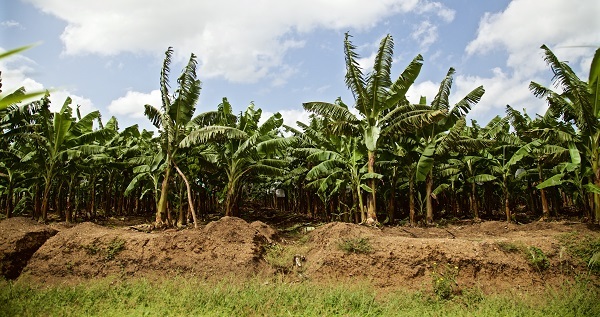 The land grabbed by the company Moïse founded, Agritrans, now hosts a private banana plantation. To grow bananas for export in a hungry nation, Agritrans received at least $6 million in state loans, and possibly much more. Agritrans seized a 1,000-hectare (2,371-acre) tract from farmers, bulldozed their houses and fields, used bribes to buy local support, distorted claims of its benefit to local residents, and created a phantom organization to legitimate itself. Should he become president, the company Moïse created would likely be a bellwether of loss of family livelihood and domestic food production. To stand for office, Moïse stepped down from Agritrans last year, though he is still campaigning under the moniker Nèg Bannann, or the Banana Man. He portrays himself as an entrepreneur determined to transform Haiti’s agricultural sector into private enterprise. Moïse alone will appear on the presidential ballot after the only other candidate who was imposed on the run-off slate said that he would not participate in “this farce… [of] selections.” Moïse is from the political party of the current president Michel Martelly, whose principal platform has been “Haiti: Open for Business.” Martelly himself came into office in 2011 through an invalid election backed – like the current one – by the US. Secretary of State Hillary Clinton played a pivotal role in imposing him. A Moïse presidency would ensure that political decisions prioritize free trade and private enterprise over support for the destitute majority. This, in turn, would likely give a green light to massive land grabs that are planned or in process, while peasants working the land would be dispossessed. In August 2013, according to local residents, Agritrans forcefully expelled hundreds of farmers who were legally using the land. 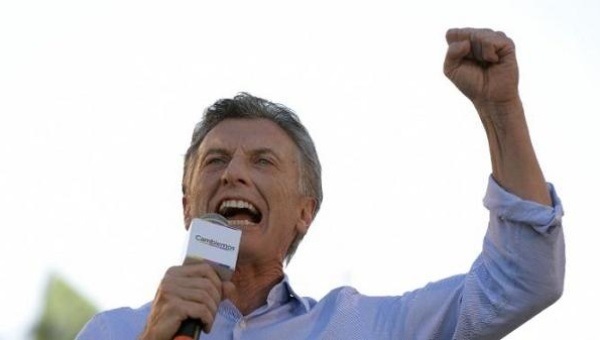 Local leader Milosten Castin, coordinator of the organization Action to Reforest and Defend the Environment, said that, with no warning, several bulldozers invaded the land, plowing under crops and forage used for grazing. The machines later destroyed the homes of at least 17 families, many of whom remain homeless today. The Agritrans plantation is the first agricultural free trade zone in the country, established by the Ministry of Commerce and Industry. This allows the company to take advantage of perks of reduced tax and tariff payments, along with special customs treatment. By Haitian law, free trade zones must export at least 70% of their products. Currently, Agritrans’ production – an estimated 40 containers of bananas weekly – is shipped to Germany. At the same time, Haiti does not produce enough food to feed itself. Destitute Haitians must rely on imported staples, whose costs are expected to rise this year. Another land grab may be imminent. In order to comply with the contract with its German client, within the next three years Agritrans must ramp up production in order to ship 150 containers, equalling 160,000 tons, to Germany each week. According the current CEO of Agritrans, Pierre-Richard Joseph, this increase will require 3,000 more hectares of land. One of the main demands of peasant groups in the region, like their counterparts around Haiti, is food sovereignty, whereby people democratically control the production of food to meet the needs of their country through local, ecological, and small-scale agriculture. Another demand is government support for family farming, including access to land, water, and markets. Moïse described the land in question as “abandoned,” and also stated that Haiti has over one million hectares of land “that is being used for nothing.” Local peasant groups disagree. They argue that prior to Agritrans’ takeover of the 1,000 hectares, the semi-arid land was actively used by peasants, despite the limited resources available to them. Peasant organizations and individual farmers were grazing cattle on it, and selling the milk to NGOs and small-scale milk and yogurt processors. Other farmers grew crops like millet, cassava, corn, beans, and sweet potatoes, both to feed their families and sell on the local market. Now that the land is held by Agritrans and millions of dollars in state loans have been invested in it, row upon row of lush banana trees grow there, irrigated by pumping groundwater. The transformation reveals a fundamentally political question: If the land had the capacity to become so productive, why didn’t the government support peasant farmers to make it so, instead of providing massive support to private interests? Moïse has cited the banana plantation in his campaign as evidence of his ability to create much-needed jobs in a country where formal employment is 13%. Agritrans says it will create 3,000 desperately needed jobs once the plantation reaches it full capacity, propelling the local economy. As of March 2015, only 600 jobs had been created, including for agronomists, engineers, agricultural technicians, and farm laborers. However, according to interviews with some of those laborers, “jobs” on the seized land are defined as 15-day shifts. This creates both precarious, short-term jobs for families and misleading employments figures. Workers are paid the minimum wage of 200 gourdes (US$3.53) per day, plus a plate of food — an amount which Haitian workers and other organizations, as well as some prominent factory owners, say cannot support a household. The minimum wage covers just 19-37% of the cost of living in Haiti. Moïse has claimed that smallholding farmers are included in the banana business, both by providing labor as well as by holding a 20% minority share in the business. He cited the Peasant Federation of Pizans (FEPAP), claiming the consortium was made up of eight peasant groups who had previously worked the land. Ben St. Jacques, an activist with a community organization in the area, claimed that Agritrans paid peasants to support the project, offering motorcycles and televisions to FEPAP members. According to residents, most of those who found employment with Agritrans had never before had access to the land. The organizations that allegedly comprise the confederation of FEPAP had legal access to only approximately 100 hectares prior to Agritrans’ take-over. Conversely, most of those who had worked the land before being kicked off, and who had protested their eviction, never found wage-work on the plantation. Joshua Steckley is a research and freelance videographer who has spent over five years living in Haiti. Beverly Bell, coordinator of Other Worlds, is an organizer and writer who has worked with social movements in Haiti for 35 years. Natalie Miller, Other Worlds’ Media and Education Coordinator, also helped with this article. This is the third piece in a series on land rights and food sovereignty in Haiti, featuring critical research and analysis, as well as interviews with grassroots leaders and people affected by land grabs. The series is made possible through generous funding from the 11th Hour Project, American Jewish World Service, Anderson-Rogers Foundation, Ansara Family Fund, Bridge Fund of Tides Foundation, Mary N. Lloyd Memorial Fund of the Peace Development Fund, Maverick Fund of the Peace Development Fund, Presbyterian Church Hunger Program, Sisters of Mercy, Small Planet Fund of RSF Social Finance, and Tèt Ansanm Fund.